How to Make a Color Wheel. When you are learning to paint, or even if you just need a reminder of how colors relate to one another, creating a color wheel is helpful. You start with the primary colors, and then create the rest of the color wheel by mixing the secondary colors. Color wheels can be created with different mediums, but watercolor paints are probably the easiest to mix and use. Draw an equilateral triangle on a piece of paper. Paint a yellow circle at the top point of the triangle, a blue circle at the bottom right point of the triangle and a red circle at the bottom left point of the triangle. Yellow, blue and red are the primary colors and are connected on the color wheel by this triangle. Draw a circle around the triangle, passing through the yellow, blue and red circles. Mix equal amounts of yellow and blue paint to make green, and paint a green circle on the line between the yellow and blue circles. Combine equal amounts of blue and red paint to make purple, and paint a purple circle on the line between the blue and red circles. Take equal amounts of red and yellow paint and mix together to make orange. Paint an orange circle on the line between the red and yellow circles. Connect the secondary colors (green, purple and orange) with a line, creating a second, upside-down equilateral triangle. The primary color triangle and the secondary color triangle should create a hexagon inside the color wheel when you are finished. You can take the color wheel another step by including tertiary colors. These colors are created by mixing a secondary color with the primary color to its right or left. 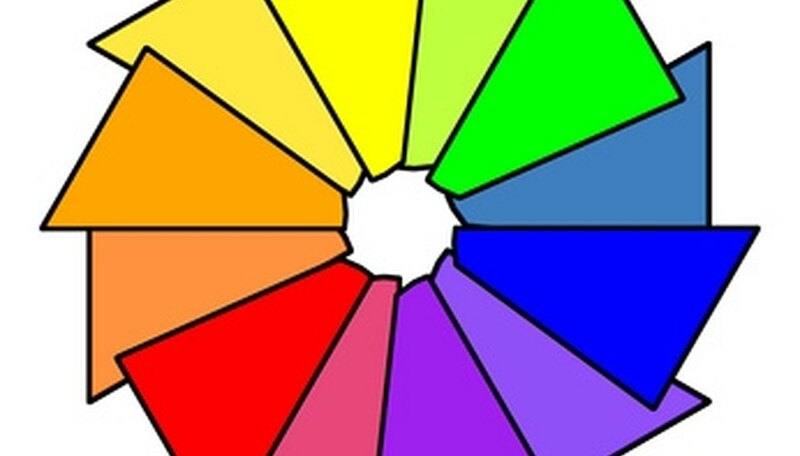 These colors are placed on the circle between the secondary and primary colors. Use equal amounts of paint to create your secondary colors. This is very important if you intend to include tertiary colors to your color wheel.